I love a shoe that makes people do a double take and these definitely fit the bill. Say hello to the El Naturalista Dome N767 Mary Jane, a unique beauty that is built from the heel up. That's right, the heel is actually created first. The natural rubber of the sole and heel bends easily and cushions impacts but recovers its shape and thickness which makes it wear out slower than synthetic materials. 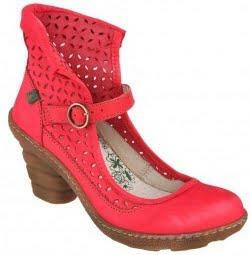 With a 3 1/4" heel, perforated leather upper, a removable, breathable and cushioned insole that absorbs harsh impacts to the heel, this Mary Jane is a fashionable way to bring an earthy style to your wardrobe.